I haven't been back to the little place in Morrilton in 19 years... but this building about a block away from the Love's Truck Stop, set back from the road, is where my family celebrated my graduation from Arkansas Tech University back in May 1995. Inside, it doesn't quite look the same. Gone are the yellowish trellis and ivy. Instead, there's neon and dark wood paneling, a patio out back and not much light. Yesterday's Bar and Grill, of course, is a bar. Traveling through the area the other day, I remembered the place and decided Grav needed to experience it too. Well, it's not quite what it once was, but we did find three items on the menu worth your time. 1. Turkey Jack. A FAT sandwich of incredibly thin shaved turkey, melted all together with Monterrey jack cheese on just plain old toasted white bread with lettuce and tomato. Doesn't sound like much, but it is. 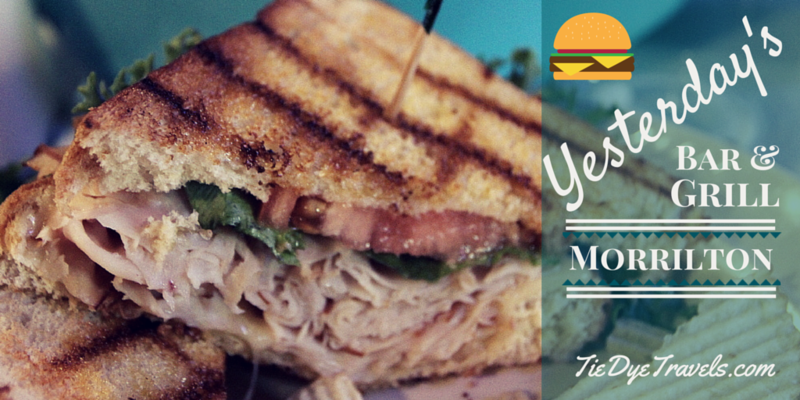 The high quality turkey Yesterday's utilizes holds that great smoked turkey flavor without giving you the sensation of a lunchmeat sandwich. Our waitress brought mustard, mayo and ketchup in squeeze bottles to the table to add, but there was really no need. This was a humdinger of a sandwich. It comes served with chips for $5.99 -- a dollar more if you want it with bacon. 2. California Chicken Wrap. Here's a two-hander for ya -- a tortilla packed with grilled chicken, guacamole, onions, lettuce, tomato and both cheddar and Monterrey jack cheese. Half will satisfy most for a lunch. $6.99 with chips. battered and deep fried cheddar cheese cubes. Which are all pretty excellent. It's served with ranch dressing. As far as lunch goes, if you're wanting a pretty decent one and you're traveling I-40, this is worth a stop-in. It's within walking distance of Love's (sorry, truckers, no real room to turn a rig around) and it's another option on that exit. You might also try dinner, which includes a selection of steaks, catfish and shrimp. And on Thursday nights, it's all you can eat spaghetti with meat sauce and garlic bread, which you can have with Petit Jean Italian sausage if you wish. Don't forget the hot sauce. This place is the BOMB !!! Great new atmosphere , great new menu and great service!!! Brought my cousins from Ohio to eat here , I suggested the heavenly catfish !!! They keep talking about it !!! Love this place !!! !